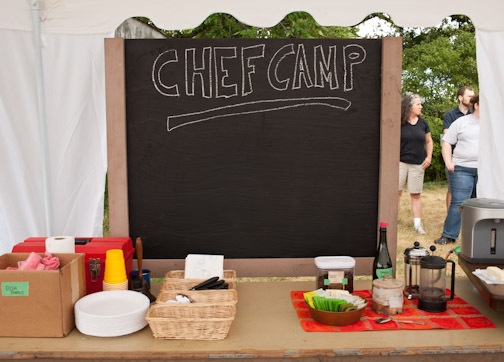 Ellen and I were privileged recently to attend Chef Camp at Spence Farm in central Illinois and it was the coolest two days ever! I want tips and knowledge to educate others – my staff, my diners, the community, my kids. I want to know how your product gets to my door. I want to develop a stronger appreciation of your product. I just want to be on a farm. It is good to know that the chefs who feed us when we eat out are thoughtful about their sourcing and working hard to make good choices. And Marty was direct with the chefs, telling them that it’s important for them to ask tough questions of the farms they buy from and to make it clear what expectations they have. We sat under a tent most of the first day, learning from Marty and Kris Travis and their twenty year-old son Will about their farm and the methods they use. My big takeaways? Sustainability and GMOs. environmental – is the farm treating the environment in a healthy way that can continue over time? physical – how big is it and how diversified? financial – is the farmer earning enough to stay in business? 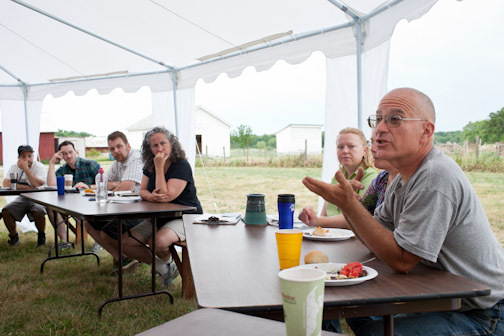 community – is the farm a welcome and contributing part of its community? soil and animal – given that piece of soil, how many animals will it support and will they be healthy? How does Spence measure itself against these metrics? Well, they farm an extremely diverse group of crops and livestock in a carefully planned rotation. They farm “beyond organic”, meaning they are not certified but feel they exceed organic standards (and their soil biologist Bob Boehle backs them on this). They use no herbicides, pesticides or GM crops. They maintain 40 acres of woods. They earn a comfortable living and it is a lifestyle they love. It is clear they are a very tight-knit family team and it was impressive to see the responsibility and ease their son Will showed. He built his own sugaring house at age 14 and sells out of all his maple syrup each year even before he starts! When asked how big they felt was comfortable, they were emphatic that they don’t want their farm to be anything the three of them can’t handle. They do all the work now and expect to keep it that way – that is a very conscious part of their definition of sustainable. Regarding the farm’s contribution to the community, they are very careful not to simply be a niche farm that is selling to Chicago and not in tune with their neighbors. They are currently organizing a local shared garden initiative for the small town they’re near; they started the Stewards of the Land group years ago that works to help young farmers (10, 14, 17 year-olds!) get started and supports them with a farming community knowledge base; and they formed the Spence Farm Foundation which organizes on-farm trips for families, school groups and chefs to learn about farming and food. With the push to have mandatory GMO (Genetically Modified Organisms) labeling in California this fall, lots of questions regarding GMOs are on peoples’ minds recently. Ellen’s been thinking and writing about them after our Meal One. Our friends at Just Farmers are blogging about whether the labeling is a good idea or not. A lengthy report from genetic engineers and scientists at Earth Open Source just came out which questions all aspects of GM safety, research and regulation. So my GMO antennae were up at Spence Farm and I have their perspective to share. Kris and Marty are extremely thoughtful and direct. They described two piles of plant residue sitting in fields, one GM corn, say, and the other, non-GM corn. Animals would eat the non-GMO. They also say that soil microbes do not recognize GM plant residue as natural food. So why should we recognize it as food? Lastly they made the point that they do not have bug and disease issues on their farm. So GMOs don’t strike them as natural nor necessary. They told another interesting story. There was a point years back when their land, owned by Marty’s mother, was being farmed by someone else. The family insisted that this contract farmer use non-GM crops. He resisted but had to concede since it was their land. So he farmed their land and also other property in the area. Yields on the Spence Farm were higher and they spent less money on seed. We were all incredulous to learn that despite this experiential information, the farmer was not convinced and did not implement non-GM crops elsewhere. The Travis family and their soil consultant Bob Boehle all agreed – the answer was convenience. In their opinion, it takes less work to farm GM crops. So a small, diversified, beyond organic farm can be financially viable; it can be energizing and rewarding to the farmers; it can give back immensely to its community; it can care for the land, raise its animals on pasture and provide large quantities of nutrient-dense produce and meats to the nearby marketplace. All with a drizzle of maple syrup on top! Spence Farm, it was a pleasure to meet you! This entry was posted on July 12, 2012 by Grant Kessler. It was filed under Meal Post . Hi Grant! I am glad to see projects like this that chef’s can attend to literally “get their feed dirty” while learning about the meals they produce! I love the information that is pointed out about sustainability, it truly is different for each individual farm and has several layers to it. One of those layers is animal welfare, to often I hear foodies and others talk about sustainability and animal welfare as two separate aspects when in all reality most farms look at the welfare of their animals as one of the most vital components of their future. On GMO’s, some good points to consider and I will admit I have not heard a few of the arguments presented. The most important thing to remember is that we cant just lump all GMO’s in one basket, each one has a different use and should be examined independently from each other looking at both its con’s and pro’s. In a conversation I had with Ellen a while back I mentioned that I periodically look into planting non GMO soybeans, as for the past 18 years we have been 100% Roundup Ready. looking at it economically every year is different and at some times it can be more profitable to grow non GMO’s vs GMO soybeans, it all depends on what premium the marketplace is willing to pay. That is not the biggest drawback for me though, and neither is convenience as I a big part of sustainability on our farm is the environment. If I were to plant non-GMO soybeans I would have to spray twice the amount of chemicals on our ground to control weeds, many of which can remain in the soil for up to 12 months decreasing the amount of organic matter that can grow and accumulate over the winter months. Compare this to Roundup that only lasts a day and 2,4-d two weeks we can start to see how and why convenience goes hand in hand with environmental sustainability due to the fact that the longer the residual the more time we as farmers need to spend managing our application to control that we are using them in a safe and environmentally friendly method. As for what I plant next year, I am still looking into this to see what is best for our farm. Good info, keep it up! Great blog. Love to see these kinds of success stories on a small acreage. A few points to ponder on the GMO comments. First, I have heard from other sources about the animals choosing the Non-GM over the GM crops. I was actually thinking about tying an experiment on our farm with the sheep. Did these guys actually see this in an on-farm experiment or did they just hear about it somewhere? Second, I am very suspicious about the accuracy of this statement: “They also say that soil microbes do not recognize GM plant residue as natural food.” This statement could be in reference to modern crops (corn in particular) that produce plant residue that does not break down in the soil as quickly as crops with older genetics (such as heritage corn). This lack of breakdown is not due to the GM component of the modern corn. Both modern GM and non-GM corn hybrids have more durable residue because the stalks have been traditionally bred to be stronger so the plants do not fall over prior to harvest and lose yield. It is not the GM component that causes this (though the GM component can protect the roots and stalks from insect damage). I would be curious in hearing more about that. Also, with regard to the improved yields with non-GM crops, there are a million factors that could have resulted in higher yields (previous cropping practices, soil organic matter, soil type, drainage, rainfall, hybrid selection, on, and on and on). 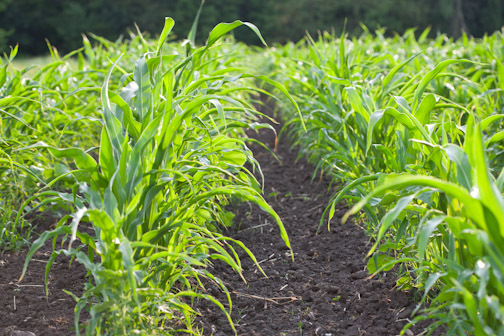 Commercial genetic modification, to date, does two things for corn and soybean crops in terms of yield: provide insect resistance to corn rootworm and corn borer and provide herbicide tolerance. If the farmer does not have pressure from these two pests (which many do not) and they control weeds with some other measure than the herbicide the crop is resistant too, the genetic modification of the crop makes no difference in terms of yield. So, the fact that he got better yields on that farm really has very little to do with the crops being GM or non-GM. It is much more likely due to the effort in stewardship of caretakers of the Spence land in the previous years, or the soil type or the weather. It is nearly impossible to quantify such statements without well designed trials to determine which differing factors really made the yield difference.